An ancient Greek trading ship dating back more than 2,400 years has been found virtually intact at the bottom of the Black Sea, the world's oldest known shipwreck, researchers say. Archaeologists are heralding the discovery of an unusually intact ancient shipwreck, found more than a mile below the surface of the Black Sea off of the Bulgarian coast. The 2,400-year-old wooden vessel features elements of ship construction, including the mast and rowing benches, that until now have not been preserved on ships of this age. An announcement of the discovery, made by the Black Sea Maritime Archaeology Project (MAP), first appeared in the Guardian. MAP has discovered more than 60 historic shipwrecks during a three-year survey of the Black Sea. 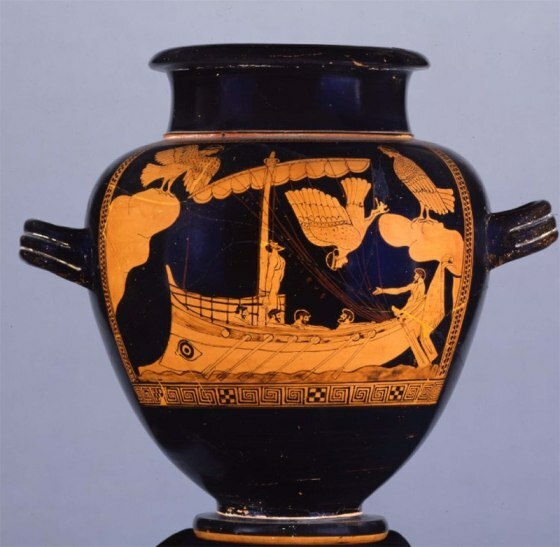 The 75-foot-long ship, documented by a Remote Operated Vehicle (ROV) equipped with cameras, appears similar to merchant vessels depicted on ancient Greek vases. The 'Siren Vase' showing Odysseus at the mast. 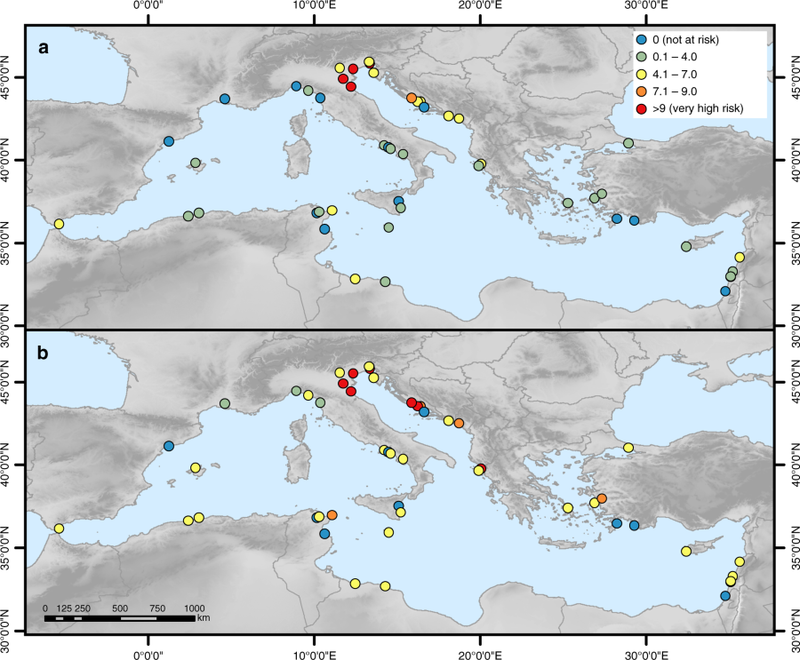 A small piece of the wreck was raised and radiocarbon dated to around the fifth century B.C., a time when Greek city-states were frequently trading between the Mediterranean and their colonies along the Black Sea coast. While older intact sailing vessels have been recovered from Egyptian burial sites on land, it is unusual for submerged ancient wrecks to be preserved so well. The unique preservation of the 2,400-year-old ship is due to the unusual water chemistry of the Black Sea and the lack of oxygen below 600 feet. This anoxic layer, which makes up nearly 90 percent of the sea’s volume, prevents physical and chemical processes that cause organic decay to take place. East Island in French Frigate Shoals is critical habitat for Green Sea Turtles, Monk Seals, and many types of sea birds. 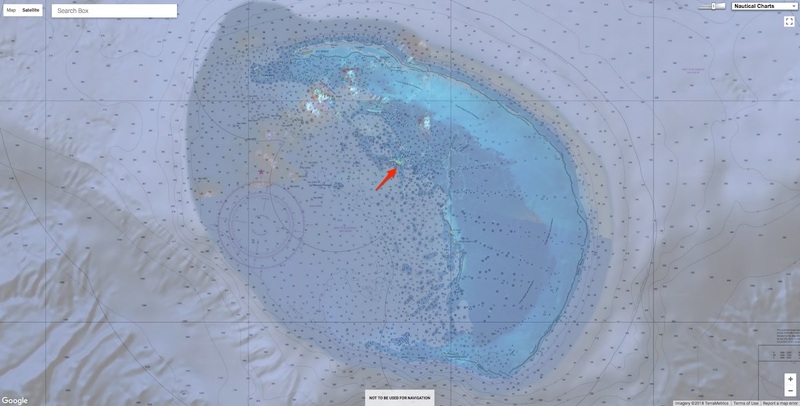 The Coastal Geology Group from SOEST, University of Hawaii, is investigating the age, origin, evolution, and current status of this island, and Gin Island, to improve understanding of how they may respond to current and future sea level rise. The island’s dramatic vanishing act was first reported by Honolulu Civil Beat and confirmed by HuffPost. Satellite images distributed by the U.S. 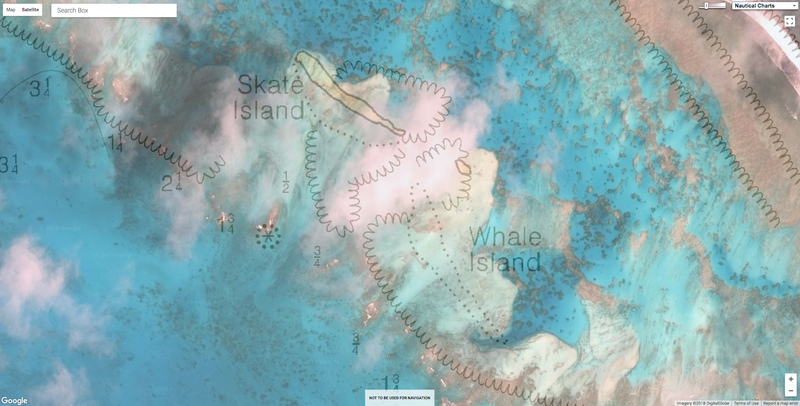 Fish and Wildlife Service show the spit of white sand almost entirely erased, scattered out onto the reef to the north. The U.S. Fish and Wildlife Service did not immediately respond to a request for comment. 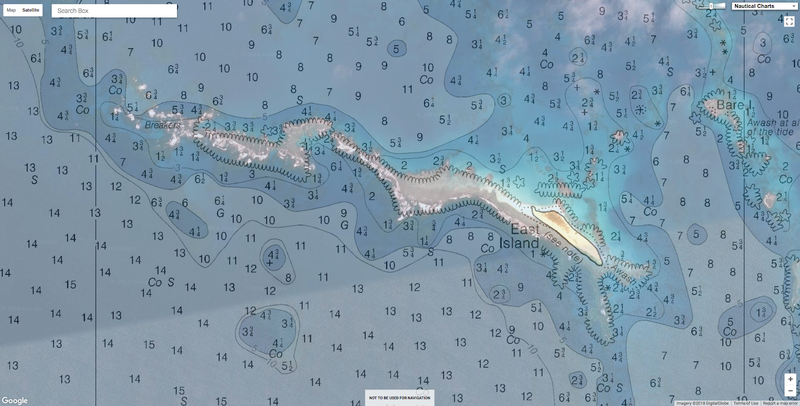 East Island was destroyed by storm surge from Hurricane Walaka, which roared through the northwestern Hawaiian Islands as a powerful Category 3 storm this month. Seven researchers, including three studying green sea turtles on East Island, were forced to evacuate from French Frigate Shoals before the storm. The biggest concern, he said, is the persistent loss of habitat, which has been identified as a significant threat to monk seals and green sea turtles. Nearby Trig Island was also lost beneath the surface this year, not because of a storm but from high wave activity. “These small, sandy islets are going to really struggle to persist” in a warming world with rising seas, Littnan said. 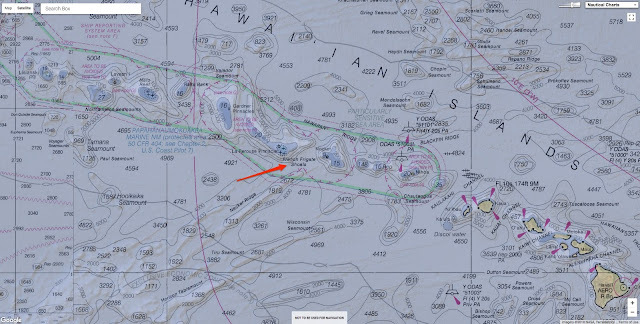 French Frigate Shoals is the nesting ground for 96 percent of the Hawaiian green sea turtle population, and approximately half lay their eggs at East Island. Historically, it has been the “single most important” nesting site for the turtles, he said. All nesting females had left by the time Walaka hit, so the storm likely had little if any impact on the adult population. But NOAA scientists estimate that 19 percent of this year’s nests on East Island had not yet hatched and were swept away by the storm. 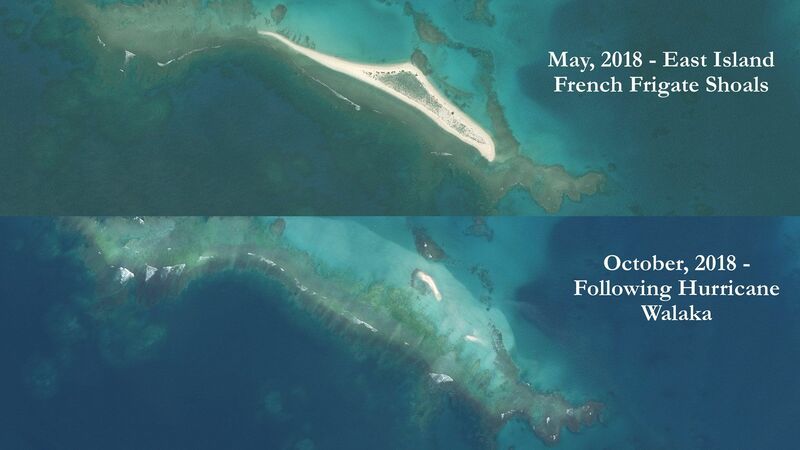 And 20 percent of the turtle nests on nearby Tern Island, the largest island in the French Frigate Shoals, were lost. The island played an important role for wildlife, including the critically endangered Hawaiian monk seal, a species that numbers just 1,400 individuals. The island was also a critical habitat for the federally protected Hawaii monk seal, one of the most endangered marine mammals on the planet. Roughly 80 percent of the population of just over 1,400 seals live in the northwestern Hawaiian Islands, a remote archipelago that is surrounded by the Papahanaumokuakea Marine National Monument. In a typical year, 30 percent of monk seal pups are born at East Island. In 2018, 12 pups were born there, and NOAA said it believes that all but maybe one had been weaned before the storm hit. “This is not surprising when you consider the bad luck of a hurricane going into that vicinity and sea level rise already sort of deemed the stressor in the background for these ecosystems,” he said. This month the Intergovernmental Panel on Climate Change, the leading United Nations consortium of researchers studying human-caused climate change, issued a dire warning about the threats the world now faces. Failing to overhaul the global economy and rein in carbon emissions would come with devastating, perhaps irreversible effects, the IPCC found. The scientific community — including experts at NOAA — has long warned that anthropogenic climate change influences extreme weather events. Phil Klotzbach, a hurricane expert at Colorado State University, said the central Pacific is one area where a lot of models forecast that climate change will trigger more frequent and stronger hurricanes. 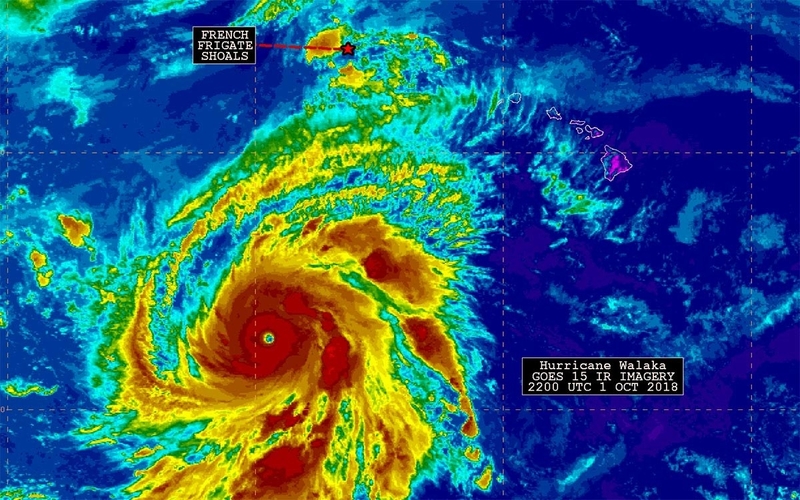 He said Walaka rapidly intensified at an “impressive rate,” from a tropical storm with 40 mph winds to a major hurricane with winds of 120 mph in just 30 hours. From satellite imagery and observations during a flyover of East Island and Tern Island, Littnan said, NOAA scientists expect that all the islets in French Frigate Shoals were completely washed over by the storm surge. It’s unclear if any others experienced significant damage. There’s no telling if East Island will return. An islet named Whale-Skate Island, also once an important habitat for Hawaiian monk seals, vanished from French Frigate Shoals in the 1990s and has not reappeared. Clark, Fletcher and Littnan said scientists are already exploring what, if anything, can be done to intervene to protect these vulnerable habitats and increase the resilience of the affected species. Those efforts could include pumping sand back above the ocean’s surface to restore islets. OpenROV’s cheap robots help people explore their local waterways, and National Geographic is helping get them to more people so they can map their discoveries. Since David Lang cofounded OpenROV, a low-cost underwater drone company, in 2012, thousands of citizen scientists and explorers have used the bots to explore things like starfish deaths in the Pacific Northwest, or where along the coast of Mexico Nassau grouper tended to spawn. That information launched bigger efforts to study, document, and ultimately try to protect those species and the places they live. National Geographic liked idea so much they’re expanding it. 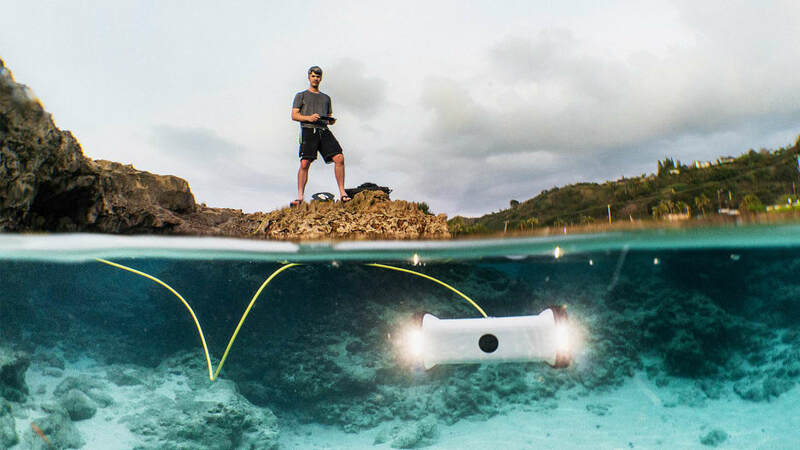 Earlier this month, the company, in partnership with OpenROV and James Cameron’s Avatar Alliance Foundation announced the launch of the Science Exploration Education Initiative to donate 1,000 Trident drones to nonprofits, schools, and activists interested in documenting their adventures on Open Explorer, an online field journal that Lang also helped design. Open Explorer publicly maps where each project is located and lets groups post updates about observations there. Trident drones can dive 100 meters deep while streaming video. The $1,5000 devices are typically piloted through a video game-style controller designed to fit around an Android tablet. “We have always been idealists in wanting to use technology to really help connect people to the natural world,” says Lang, who considers the ocean a place that most people don’t really understand or even know how to engage with. “[We’re] doing that not with a lecture on what’s important, but by giving people the thrill of exploration,” he adds. Lang and his friend Eric Stackpole built OpenROV’s first prototypes in a garage and raised money through Kickstarter: 1,800 people contributed nearly $1 million. The duo set up Open Explorer in 2014 after another crucial insight: Along with opening access to a new frontier, they felt obligated to help guide how their new tools might be best used. “The robots are key to getting people to find these places, but the other part of it was giving people a place to tell these stories of adventure and exploration and citizen science,” he says. Lang gave a TEDx talk in Berkeley, California, to coincide with SEE’s launch. In it, he pointed out that oceanic conservation efforts are nearly 100 years behind the land-based ones that lead to the creation of national parks. But remote exploration tools that highlight challenges of starfish and grouper (among many other things) can certainly make a good case for acting more quickly now. SEE’s philanthropic angle makes underwater drones affordable and accessible to everyone. Other backers of the project include Rolex, the Gordon & Betty Moore Foundation, and OceanX. But National Geographic is already thinking bigger. 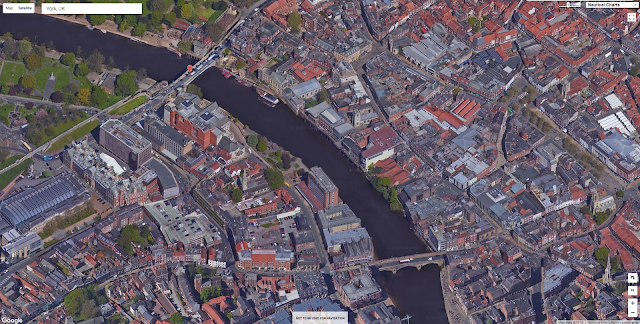 Earlier this year, it acquired Open Explorer for an undisclosed sum. It’s since deepened the platform’s content across many more terrains–categories include air, land, sea, urban, and backyard missions (along with historical feats featuring archived photos and videos). People interested in applying for the initiative should visit SEE’s homepage, sign up to start an expedition, and then share more about how they’ll use the Trident. Several dozen groups have already received robots and are chronicling their efforts. “It’s fine to buy a robot and to have a robot, but what we’re really trying to do is give people the tools to make their life more interesting,” Lang says. Greenpeace ship the Arctic Sunrise in Charlotte Bay, Antarctic peninsula. The ocean is threatened by climate change, pollution and fishing. Not just cold, but colder than anything I had experienced in my life. I had visions of bedraggled explorers in blizzards with ice-covered beards. But standing there, in the bright Antarctic sun, watching creaking blue icebergs, penguins bursting in and out of the water, I felt utterly content in this glistening wilderness. What I hadn’t thought about was the dark. And not the dark of night – although as a European, that brought a dazzling new astronomy of the southern hemisphere to me – but the dark of the deep, icy, ocean depths. I was going almost half a kilometre down to the Antarctic seafloor. It was back in January of this year, and I had joined a Greenpeace research expedition as part of a campaign to create a vast Antarctic ocean sanctuary. At 1.8m square kilometres, it would be five times the size of Germany. If it’s created, which it could be when governments meet in the next few weeks, it would be the largest protected area anywhere on Earth. I am one of two million people who want it to happen. Scientists on the ship were using tiny submersibles to go where humans had never been before to explore ecosystems we know so little about: deep habitats they had been looking at on screens all their working lives but had never seen with their own eyes. The excitement was more arresting than the cold of the Antarctic summer. So there I was, descending, in a small, two-person submarine to the frontiers of human knowledge. The light faded, and the sea around us turned a heavy blue. As we sank to hundreds of metres below the surface, I was surrounded by a thick blackness. It was a colour that I had no idea the ocean could turn. Chinstrap penguins at Orne harbour in the Antarctic. A torch at the front of the submarine shone like a night-light for a child afraid of the dark. It showed the way to the seabed. The sight as it came into view was staggering. Out of the dark and freezing depths emerged a moving, crawling, vibrant mass of life. The temperature is so low that vegetation barely survives down here. Nearly everything is an animal: bizarre and ghostly icefish that are semi-transparent; sea spiders that look like something out of a science-fiction film; colourful, tendrilled, feather stars, basket stars, corals, sponges. I’m told that more people have been to the moon than have been to the bottom of the Antarctic ocean. Maybe that’s apocryphal, but it certainly feels like it. We know precious little about this alien environment, which is why it is so crucial to protect it before it is too late. Emerging back into the light at the surface, the bubbles of the submarine hull clearing, it was like waking from a dream, the intangible creatures of the abyss left far behind. I had truly seen the light and the dark of the Antarctic. At its surface, penguin colonies stretch for miles on snow-capped islands, with millions of breeding pairs across the region, raising their chicks in this inhospitable environment. Enormous whales surface all around, feeding on huge pink clouds of the small shrimp-like krill, which nearly all wildlife here relies on. Fur seals and elephant seals lounge on drifting blocks of ice. While below, another world goes on existing in dark vitality. Underwater view of the submarine Little Planet, part of the Greenpeace expedition. So often, we lament the destruction of the environment once it has taken place. And it is true that wildlife in the Antarctic is facing threats from climate change, pollution and industrial fishing. But this area still remains one of the least-touched regions on the planet. Right now, we have an opportunity to protect this place. The governments responsible for conservation of the Antarctic’s waters meet in Hobart, Australia, in the second half of October. What better conservation of the Antarctic ocean could there be than the creation of the largest protected area on Earth at its heart, in the Weddell sea. It would put the area off-limits to future human activity, protect wildlife such as penguins, seals and whales, and help to tackle climate change. I am proud to stand as one person in a movement of more than two million that has come together this year to demand world leaders protect the Antarctic. Most of these people will never visit the Antarctic, but their passion for protecting it inspires me. Across the world, people have written to their politicians; they have encouraged their friends and family to take action; they have dressed up as penguins and danced on ice to raise awareness from the streets of Buenos Aires to Beijing; they have installed penguin sculptures from Johannesburg to Seoul. This is a global movement for a region that belongs to us all. The mass of the Antarctic ice sheet has changed over the last several years. Research based on observations from NASA’s twin NASA/German Aerospace Center’s twin Gravity Recovery and Climate Experiment (GRACE) satellites indicates that between 2002 and 2016, Antarctica shed approximately 125 gigatons of ice per year, causing global sea level to rise by 0.35 millimeters per year. These images, created with GRACE data, show changes in Antarctic ice mass since 2002. Orange and red shades indicate areas that lost ice mass, while light blue shades indicate areas that gained ice mass. White indicates areas where there has been very little or no change in ice mass since 2002. In general, areas near the center of Antarctica experienced small amounts of positive or negative change, while the West Antarctic Ice Sheet experienced a significant ice mass loss (dark red) over the fourteen-year period. Floating ice shelves whose mass GRACE doesn't measure are colored gray. Now, as governments prepare to meet at the Antarctic ocean commission there are millions of eyes watching them and urging them to act. To secure the Antarctic for future generations. To allow its abundance of wildlife to flourish and its migratory species to thrive between the world’s oceans. To help create healthy oceans that contribute to global food security. To preserve the Antarctic ocean’s functions as one of the world’s largest carbon stores. Because, truly, what happens in the Antarctic affects us all. NYTimes : Will We Protect Antarctica or Exploit It? The research highlights the fact that climate change isn’t just a problem for the future and makes the case for more immediate adaptation measures to protect these vulnerable areas. In some high-risk cases, the scientists suggest governments may even want to consider the possibility of relocating moveable World Heritage sites. This photo shows the old town of Dubrovnik from a hill above the city. The World Heritage, a project of the U.N. Educational, Scientific and Cultural Organization (UNESCO), identifies locations around the world that have great cultural or international significance. They are often areas that stand as testaments to outstanding architectural or technological innovation, artistic achievement, or cultural traditions; that document significant phases in human history; or that possess great natural beauty or ecological importance. 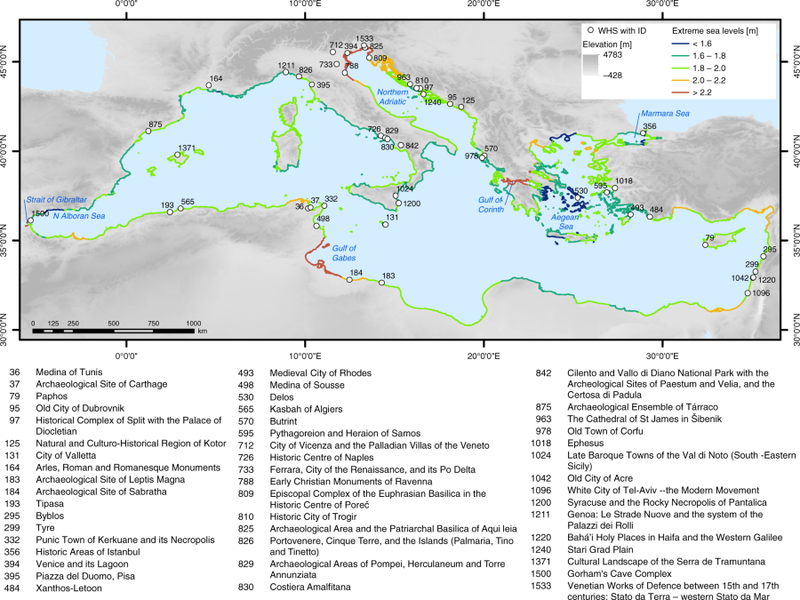 UNESCO cultural World Heritage sites located in the Mediterranean Low Elevation Coastal Zone (LECZ). All sites are shown with their official UNESCO ID and name. Flood risk index at each World Heritage site under current and future conditions. 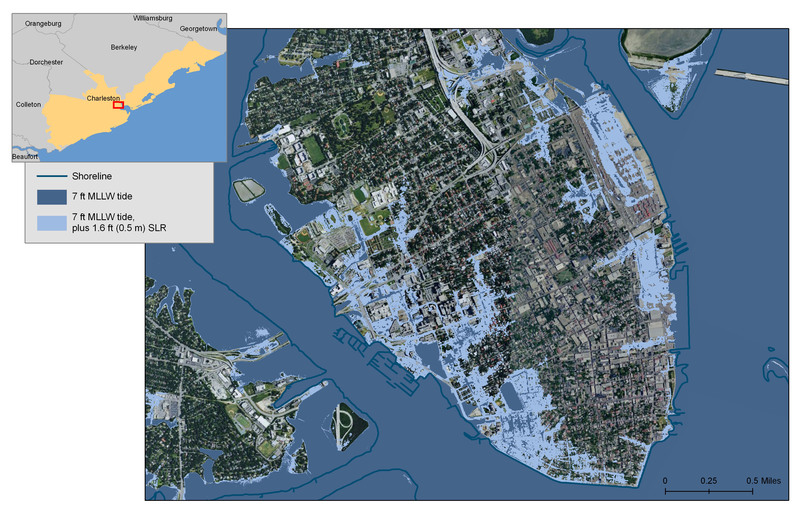 When considering flooding threats, they evaluated sites based on their risk of experiencing a 100-year flood—that is, a flooding event severe enough that it has only a 1 percent chance of occurring in any given year. Erosion risks were primarily based on a site’s distance from the coastline. Most sites, though, are at risk from both flooding and erosion. And most sites facing risks in the future are in trouble now. Those risks will continue to rise throughout the end of the century, particularly under the more severe climate scenarios. The research underscores several major points, the scientists say. Large-scale global climate action will be necessary to avoid extreme climate scenarios and prevent as much additional risk to the World Heritage sites as possible. Some of the areas on the list have already begun designing their own adaptation strategies. 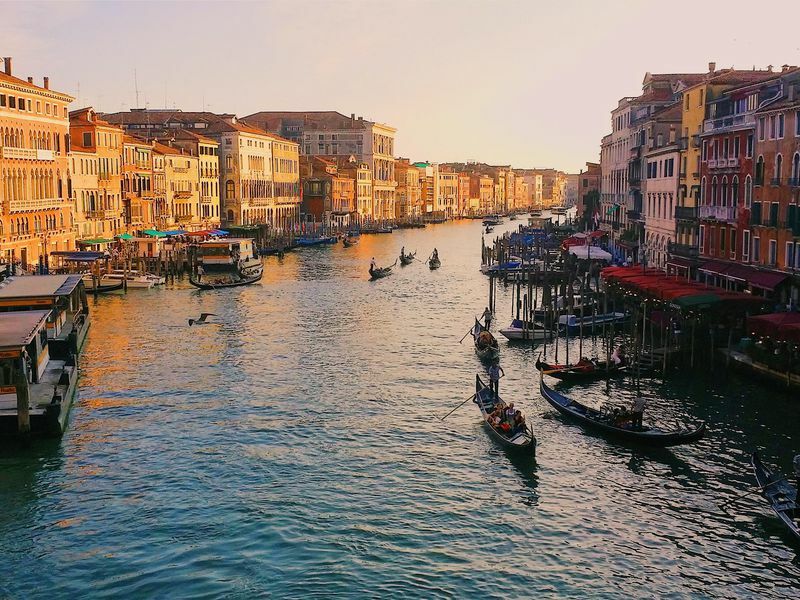 The Italian government began work on a system of retractable floodgates in the Venetian Lagoon more than a decade ago. It’s designed to protect Venice from the impact of storm surge. But whether it will succeed is another question: The project has been fraught with delays and has yet to be completed. As time ticks on, the need for concrete action may only become more urgent. And it’s not just the Mediterranean whose history is at risk of being washed away. UNESCO began preparing reports and case studies on climate change and global World Heritage sites as far back as 2006 and published a guide for adaptation in 2014. Other studies have also focused on the effects of climate change on culturally important sites around the world. One 2014 study in Environmental Research Letters suggests that about 19 percent of World Heritage sites around the world would be threatened by sea-level rise with a temperature increase of 3 degrees Celsius—the warming that might be expected under the current commitments to the Paris climate agreement. That’s compared with 6 percent with no additional warming. Other research has taken a more local approach not necessarily limited to UNESCO sites. A 2014 report published by the Union of Concerned Scientists compiled a collection of case studies focusing on how U.S. national landmarks—including sites such as Ellis Island and Cape Canaveral—might be affected by climate change impacts including sea-level rise and an increase in wildfires. Multibeam and laser survey of the River Ouse through York city centre. 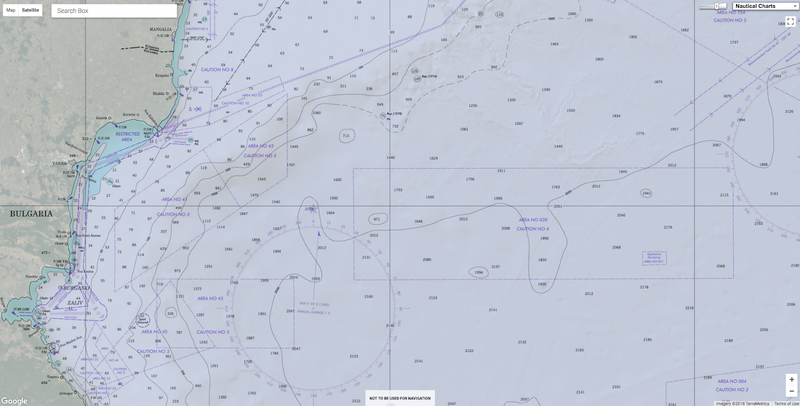 Data acquired using Ultrabeam's Ultra-1 USV.